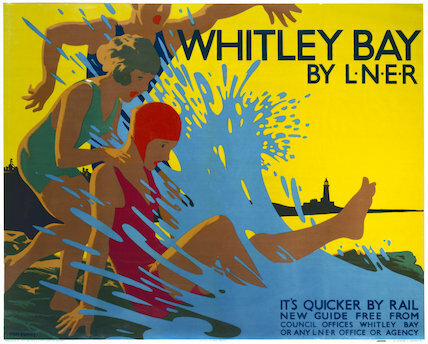 Poster produced by London & North Eastern Railway (LNER) to promote rail travel to Whitley Bay, Tyne and Wear. The poster shows three figures on the sand on the beach, being splashed by an incoming wave. Artwork by Tom Purvis (1888-1957), who rallied for the profesionalisation of commercial art. In 1930 he was one of the group of artists who founded the Society of Industrial Artists, which campaigned for improved standards of training for commercial artists in order to broaden their scope of employment. He became one of the first Royal Designers for Industry in 1936. 'Mablethorpe & Sutton-on-Sea', LNER poster, 1923-1947. 'Norfolk - It's Quicker by Rail', LNER poster, 1923-1947. 'The Coronation', LNER poster, 1923-1947. 'Yorkshire Coast', LNER poster, 1923-1947. 'Be Early', LNER poster, 1923-1947. 'Cruden Bay', LNER poster, c 1930.